The meeting with the Holy Father took the form of a dialogue. The questions, presented by members of the Movement, were based on the five strategic fields of Schoenstatt’s apostolate, identified and defined at Conference 2014 held in February 2009 and attended by representatives of 33 countries. 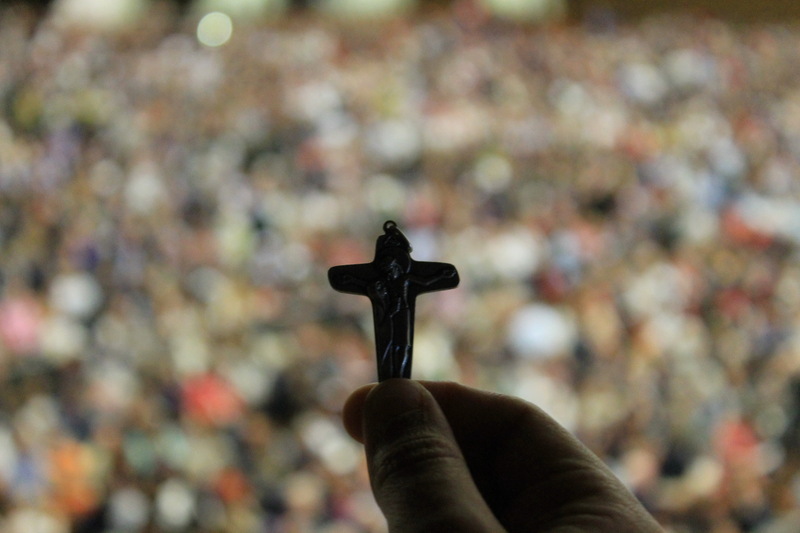 The apostolic projects in these five areas – family, youth, education, new social order, Church — which formed an essential part of the 2014 Jubilee celebrations — speak to the signs of the times and the challenges that contemporary mankind faces, making it a dialogue that emerges from “actions.” They reveal real life and not just theoretical speculation, giving it more impetus and power of conviction. In order to focus on Pope Francis’ message, the original questions were condensed to capture the most important element in each of them. 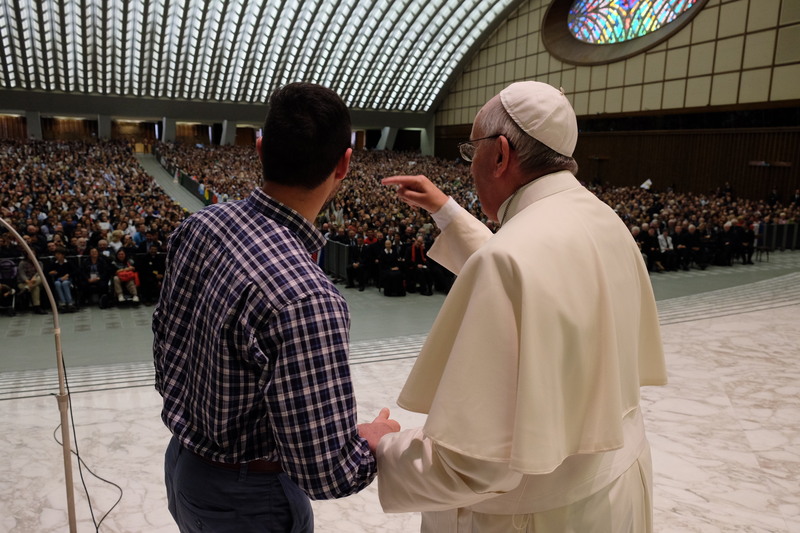 The Holy Father uses the format of an honest and direct dialogue to give us his vision and expectations of the topics which formed the focus of the experiences and pastoral projects of the jubilee celebrations in Schoenstatt: family life, education, youth evangelization, the church, and a new social order. 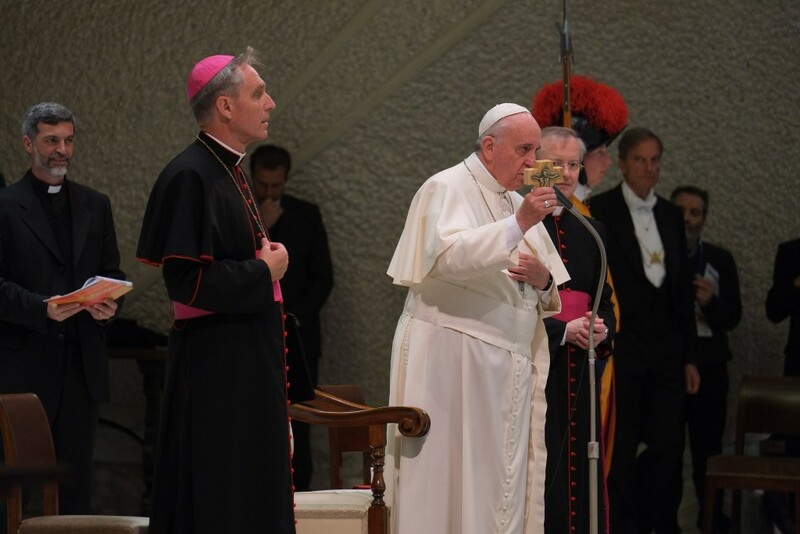 It is the Holy Father’s message to an ecclesial movement of renewal during a moment of grace, both in the jubilee celebration of our founding and this moment in the life of the Church. One can understand the deeper meaning and value of this audience when seen from the real life that preceded it and reflects an experience of the church that our founder, Fr. Joseph Kentenich, desired through his work and selflessness — a Church that is truly family, not only in spirit but also in its forms and attitudes. FAMILY: In light of the challenges that the family faces today, they asked Pope Francis for advice on how better to accompany engaged and married couples and families. “In the problem that you raised in this question, there is something very sad, very painful. I think that the Christian family, the family, marriage, has never been attacked as much as it is now. Directly attacked or attacked through actions. Perhaps I am wrong. Church historians would be able to tell us that the family is hurting, that the family hurts itself, and the family bastardizes itself, as if it were just another form of association, because we can call anything a family, not so? In addition to that, how many families are hurting, how many broken marriages, how much relativism regarding the idea of the sacrament of matrimony. At this time, be it from a sociological point of view, which looks at things from the perspective of human values, or from the perspective of the Catholic sacrament, the Christian sacrament, there is a crisis in the family. A crisis because it has been attacked from all sides and it remains very wounded. It is clear that something must be done. Therefore your question: what can we do? Yes, we can provide great talks, give a declaration of principles, sometimes we have to do this, right? Clear ideas. To say that what you are proposing is not marriage. It is an association. But it is not marriage. In other words, sometimes we have to say things very clearly, and it must be said. But in this case only, pastoral help must be body to body. In other words, to accompany. And this means wasting time. Jesus was the master of time wasting, no? He wasted time to accompany, to allow consciences to mature, to heal, to teach. To accompany means to journey together. It is clear that the sacrament of marriage has lost its value and from the sacrament, it unconsciously became a rite. The reduction of the sacrament to a rite. What happens then is that the sacrament is a social act, yes with, religious, not so, baptized people, but the emphasis is the social aspect. How many times have I found this in my pastoral life, no…people who no, no, and why don’t you get married? You are living together but why don’t you get married? No, it’s because…we have to organize a party, this, we don’t have money. And so the social aspect overtakes the most important, which is the union with God, no? In Buenos Aires I remember some priests who gave me the idea to celebrate the sacrament of marriage at any time. Normally, the civil wedding takes place on a Thursday or a Friday, and the sacramental wedding happens on a Saturday. And of course, they could not manage the two events because there is always some celebration after the first. So these very pastoral priests helped out by saying: “[get married] whenever you want.” When the civil ceremony is over, come past the parish for the church wedding. In other words, it is an example of facilitating, facilitating the preparation. You cannot prepare couples for marriage in two meetings, two conferences. That is our sin of omission, as pastors and lay people who really are interested in saving the family. Marriage preparation must take time. Accompany couples. Accompany, but always body to body and prepare. Know what they are going to be doing. Many don’t know what they are doing and they get married without knowing what it means. The conditions. What they promise. Yes, yes, everything is fine, but they were not aware that it is forever. And to all this, add this culture of temporariness in which we are living, not only in the family, but also among priests, not so. A bishop was telling me how he met a wonderful boy who wanted to be a priest, but only for ten years, and then he wanted to return. That is the culture of temporariness. You need time. “Forever” is the part that is forgotten. We have to restore many things in the wounded families of today. Many things. But we should not be scandalized by anything that happens in the family. Family dramas, the destruction of families, children. No. During the Synod, a bishop asked this question: as pastors, do we know how much a child suffers when his parents separate? They are the first victims. So how do we accompany these children? How do we help parents who are separated so that they do not use their children as hostages? Many pseudo-pathological problems whereby people destroy others with their tongues come from having watched their fathers speaking badly of their mothers and mothers speaking badly of the fathers. These are things that have to be brought home to each family, to accompany, that is, to be aware of what they are doing and there are many different situations today, not so? They don’t get married, they stay at home. They have a boyfriend or girlfriend but they don’t get married. A mother told me: Father, what must I do for my 32-year old son to marry? Well, lady, first he needs a girlfriend. Yes, yes, he has a girlfriend, but he doesn’t get married. Ok, lady, if he has a girlfriend and doesn’t get married, stop ironing his shirts, and see if that inspires him, no? That is to say, how many don’t get married. They live together, or as I have seen in my own family, they live together part time. From Monday to Thursday with my girlfriend and from Friday to Sunday with my family. In other words, these are totally destructive new forms, limiting the greatness of matrimonial love, no? Right, and because we see so much of this, living together, separation, divorce, this is why the key that can help is to accompany “body to body,” not through preaching, because that doesn’t work. Accompany them. Patience. Patience. A word today, an attitude tomorrow, I don’t know. That’s what I can suggest. She is mother. Mary is the one who helps to bring Jesus down to us. Bringing Jesus down. She brings him from heaven to live with us. 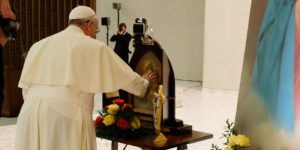 2 – PEDAGOGY: In reference to the great love that Pope Francis has for the Blessed Mother, they asked him to speak about his vision of Mary’s mission in the New Evangelisation and the renewal of the Church. “Right, the truth is that Mary is the one who knows how to transform a stable into a home for Jesus with a few rags and a mountain of tenderness. And she is also able to make a child jump in his mother’s womb as we heard in the Gospel. She is able to give us the joy of Jesus. Mary is, fundamentally, Mother. Ok, well, Mother is a very small thing, no? Mary is Queen, Lady. No. Stop. Mary is Mother. Why? Because she brought you to Jesus. She is Mother because she gives birth to Jesus and helps us with the power of the Holy Spirit so that Jesus can be born and grow in us. She is the one who continuously gives us life. She is the Mother of the Church. She is motherhood. We do not have the right, and if we do, we are wrong, to have an orphan mentality. In other words, a Christian does not have the right to “be an orphan.” You have a Mother. We have a Mother. Mother. She is Mother not only because she gives us life but she also educates us in the faith. It is very different to try and grow in the faith without Mary’s help. It is something else. It is like growing in the faith, yes, but in a Church that is an orphanage. A Church without Mary is an orphanage. Therefore she educates us, she makes us grow, she accompanies us, she touches consciences. She knows how to touch consciences, for repentance. In the south of Italy, I’m not sure if it is in Calabria or in Sicily, there is a devotion to the Virgin of the Mandarins. In an area where there are many mandarins, no? And the rogues of the area are devoted to the Virgin of the Mandarins. Thieves have this devotion. They say that the Virgin of the Mandarins loves them, and they pray to her so that when they arrive in heaven, she is watching the line of people who are arriving, and when she sees some of them, she waves them away with her hand like this and tells them not to pass, but to hide. And at night, when everything is dark and St. Peter is not there, she opens the door for them. This is a very folkloric and very popular way to tell a very great truth. Of deep theology. A Mother looks after her child to the end and works to save his life until the end. This is the premise of St. Alfonsus Maria de Liguori: anyone with a devotion to Mary is not condemned, not so? But this is at the end, right? In other words, throughout a lifetime, she knows how to touch consciences. She accompanies us in this. She helps us. Mary is the one who helps to bring Jesus down to us. Bringing Jesus down. She brings him from heaven to live with us. And she is the one who watches, cares, warns. That’s it. Something that touches me very much. The first Marian antiphon in the West is copied from the East and says: “We fly to your patronage, O Holy Mother of God.” It is the first and the oldest in the West. But this comes from a very old tradition that the Russian mystics, the Russian monks, explain as follows: in the moment, in the moments of spiritual turbulence, there is nothing to be done but to take refuge under the mantle of the Holy Mother of God. She is the one who protects, the one who defends. We recall Revelations, the passage where she goes running with the child in her arms so that the dragon will not devour the child. For as much as we can know Jesus, nobody can say that they are so mature that they do not need Mary. Nobody can do without their Mother. We, the Argentineans, we the Argentineans, when we meet a person who keeps bad company or is badly behaved, have a strong word for this, either because he lacks a mother, or doesn’t want it and has abandoned his mother’s love. It is not a bad word, it is a strong adjective and we say that this person is a “guacho” [motherless]. A Christian cannot be “motherless” because he has Mary for a Mother. 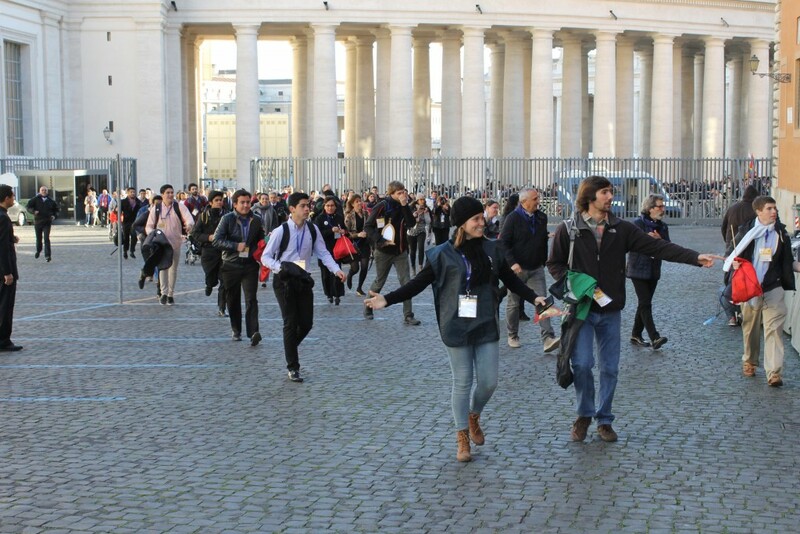 3 – YOUTH: Motivated by the missionary spirit of the Schoenstatt youth in every country, they asked the Holy Father to advise them on how to invite other young people to share a fuller life in Christ. “Let me start with a phrase from Pope Benedict XVI. The Church does not grow through proselytism but through attraction…the attraction of giving testimony. My first piece of advice: testimony. To live in such a way that will make others desire to live the same way. Like us. Testimony. There is no other way. There is no other way. Live in such a way that others will be interested enough to ask: why? Testimony. The path of testimony. There is nothing more than can be added to this. Testimony in everything. We are nobody’s saviour. We are transmitters of the One who saved us all. And we can only transmit this if we take up the life of this someone called Jesus in our own lives, in our flesh, in our history. This is testimony. Testimony. And this is not just in works of charity. Of course, we need to do these because the criteria by which we will be judged is in Matthew 25, not so? But then yes, witness in works of charity, etc. In development work, education, doing things for others. But it is more than this. Only a testimony of life. How do I live? Do I have a double life? Do I call myself a Christian but behave like a pagan? Spiritual mundaneness, the spirit of the world that Jesus condemned so often. The Gospel of John says this repeatedly. Do I more or less share my Christian faith? Half and half? Testimony must encompass everything. It’s a life choice. In other words, I give testimony because that is the consequence of my life choice. That is how you take the first step. Without witness you cannot help any young or old person, nobody. Obviously, we all waver, because we are all weak, we all have problems and we don’t always give good witness. But the ability to humble ourselves, the ability to ask for forgiveness when our testimony is not what it should be. And a testimony that is also capable of moving us, to make us go out, to go on mission, and this is not proselytism. It is to help, share, so they can see how we do it and what we do. I repeat this often. A Church that does not go out is a Church of snobs. An ecclesial movement that does not go out on mission is a movement of snobs. Furthermore, instead of going out to find sheep, to bring, or help, or give testimony, they dedicate themselves to their little group, combing sheep, not so? They become spiritual hairdressers? That’s no good! To go out means to go out of ourselves. A Church or a movement, a community that is closed becomes ill. It has all of the sickneses of isolation. A movement, a Church, a community that goes out makes mistakes, makes mistakes. But it is so beautiful to ask for forgiveness when we make mistakes. Therefore, do not be afraid. Go out on mission. Set out on the road. We are on a journey. But be careful, St. Teresa warned, that along the way, we find a beautiful place we like and we remain there, no? We forget that we have to continue on our way. Let us not remain. Rest, yes, but then we carry on our way, on a journey, not wandering. Because we go out to give something, go out on a mission. But we do not go out to walk circles around ourselves, within a labyrinth that not even we can understand. Journeying but not wandering. And then, yes, with mission, comes prayer. Nobody can say “Jesus Christ is Lord” if the Holy Spirit does not inspire them. For that, you must pray. You must recognize that the Holy Spirit is inside of you and that it is the same Holy Spirit that gives you the strength to carry on. Prayer. Do not forget about prayer. And prayer to Mary is one of the things that I ask about often when I listen to confessions. How is your relationship with the Blessed Mother? The rosary. Prayer. Let us go back to what I said earlier about Mother. So that Mother may accompany me, looks for me, tell me where there is no wine, etc, these are the things she does. Prayer, mission, go out. And something that as young people you will experience: the temptation of tiredeness. Either because you don’t see the results or, well, because the show is over and things are very boring, and I’m going to look for something else. When you feel the first symptoms of tiredness, weariness of the road, in any form, open your mouths while there is still time. Ask for advice in time. This is happening to me. I set out “in fourth gear” and now “I’m in reverse.” But the temptation of tiredness is very subtle. Because behind the temptation of tiredness, of going out on mission, is a hidden selfishness. And it is hidden, ultimately, the spirit of the world, returning to our comfort zones, where we feel good, have fun and do what we like. And so this is what I would say, so that light can shine, it cannot be hidden under the bed, no, may the light shine so that others can see the good works that the Father works through us, clearly, no? Testimony. So that others will ask you why you live this way, coherence in your life, set out on the road, journeying, not wandering and beware of the temptation of tiredness. I can’t think of anything else. What advice can you give us to invite our friends to share a fuller life in Christ? I think that this is enough, no?”. 4 – NEW SOCIAL ORDER: Referring to the wars and injustice of our time, they asked the Holy Father to share the secret of how he is able to maintain his joy and hope, and persevere in the service of the sick, the poor and the defenceless. Well, I haven’t the faintest idea, but never mind…A little of it is my personality and I would say that I am somewhat unaware. Therefore, my unawareness sometimes makes me impulsive, but I don’t know how to explain what you’re asking me. I honestly don’t know…I pray and I surrender. But it is difficult for me to make plans. I dare to say two things: That the Lord gave me the grace of having great trust to abandon myself to His goodness, even in times of great sin. And because He did not abandon me, that has made me even more trusting and I go even further with Him. I have a great deal of trust. I know that He will not abandon me. And I pray. This yes, I ask, because I am also aware of the many bad things I did and my many “mistakes” I did not abandon myself to the Lord, and wanted to be the one at the helm. I wanted to enter this murky path of self-salvation, saving myself by complying, through compliance – accomplish and lie [play on two parts of the Spanish word cumplemiento] – compliance. Compliance, which was the salvation of the Doctors of the Law, the Sadducees, those people who made life impossible for Jesus. But I don’t know. Honestly, seriously, I wouldn’t know how to explain it. I surrender myself, I pray, but He never fails me. He never fails. He never fails. And I have seen the he is capable of performing miracles through, I’m not saying through me, but through people. I have seen the miracles that the Lord has worked through people who abandon themselves into His hands. When I said that I am little unaware, I would add something else. Audacity. Audacity is a grace. Courage. St. Paul said that Christians need two great attitudes to preach about Jesus Christ: courage and endurance. That is, the courage to carry on and the endurance to bear the weight of the work. Now, this is interesting. This occurs in apostolic life, but it should, should also be present in prayer. Prayer without courage is “wishy-washy” and doesn’t work. We remember Abraham who, as a good Jew, bargains with God. What if there are 45, what if there 40, what if there are 30, what if there are 20. Talk about having a nerve. He had courage in prayer. <strongCourage! In prayer with courage. Pray with courage. “Whatever you ask for in my name, if you ask it with faith and believe that you have it, you already have it.” Who prays like this? We are are weak. Courage. And then, endurance. Endure contradiction, endure weaknesses in life, pain, illness, difficult life situations. It struck me when your General Suprerior, or Director General, mentioned the lack of understanding and rejection that Fr. Kentenich faced. This is the sign of a Christian who goes further. When the Lord makes him pass the test of rejection. Because it is the sign of the prophets. False prophets were never rejected, because they told kings and the people what they wanted to hear. That way, “ah, how wonderful” everything is and nothing more. Rejection, no? Here is the endurance. Endure life even if you have been cast aside, rejected, without exacting revenge with the tongue, calumny, defamation. And one thing is inevitable, not to look at things…you ask me what is my secret, I don’t know…but what helps me is not to look at things from the centre. There is only one centre — Jesus Christ. Rather look at things from the peripheries, because then you seem them more clearly. When one becomes closed in his little world, in the little world of the movement, of the parish, of the archdiocese, or here, in the little world of the Curia, then you cannot grasp the truth. Yes, you may understand it in theory, but you cannot capture the reality of the truth in Jesus. The truth is best seen from the periphery rather than from the center. This helps me. I don’t know whether or not this is my secret, but clearly…I remember how the world view changed after Magellan; it is one thing to see the world from Madrid or Lisbon, but it is another thing to see it from there, from the Strait of Magellan. There they began to understand something else. These revolutions that make us understand the other side of the same reality. The same thing happens with us, if we remain closed off in our little world, that defends us and everything, then we end up not understanding, and we end up not knowing which is the real truth. Then, here you have an example. In other words, he sees reality not only from the perspective of the law, of how he has to judge as a criminal expert, but from the wound that is there, and this is the truth allows him to look beyond, to see better. And for me, this is one of the most beautiful things during the days [of that meeting], when a judge tells you that he had the grace, that he has the grace to sometimes cry with a prisoner. In other words, go to the periphery, not so? I would tell you: a healthy unawareness, in other words, that God does things – pray and abandon yourself. Courage and endurance, and go out to the periphery. I don’t know if that is my secret. But it’s what I can think of to tell you about what happens with me. 5 – CHURCH. Motivated by love for the Church, and the legacy and mission of Fr. Kentenich, they asked the Holy Father how they can help him further in the renewal of the Church, and where to emphasize their evangelising action in this new phase of their Family. Renewal of the Church. Think about the great revolution. Some people are talking about the “revolutionary Pope,” all these stories. But this is perhaps the oldest sentence in Ecclesiology. The Latins, the Latin Fathers, used to say Ecclesia Semper Renovanda. The Church has to renew itself continually. Since the first centuries of the Church. And they struggled with this, so did the saints. In other words, those who take the Church forward are the saints who are were able to renew their sanctity and, through their sanctity, renew the Church. They are the ones who take the Church forward. So, the first favour I ask of you, as a help, is sanctity. Sanctity. Do not be afraid of a life of sanctity. This is what it means to renew the Church. Renewing the Church is not, in the first place, to make a change here or a change there. It must be done because life is always changing and we need to adapt. But this is not renewal. 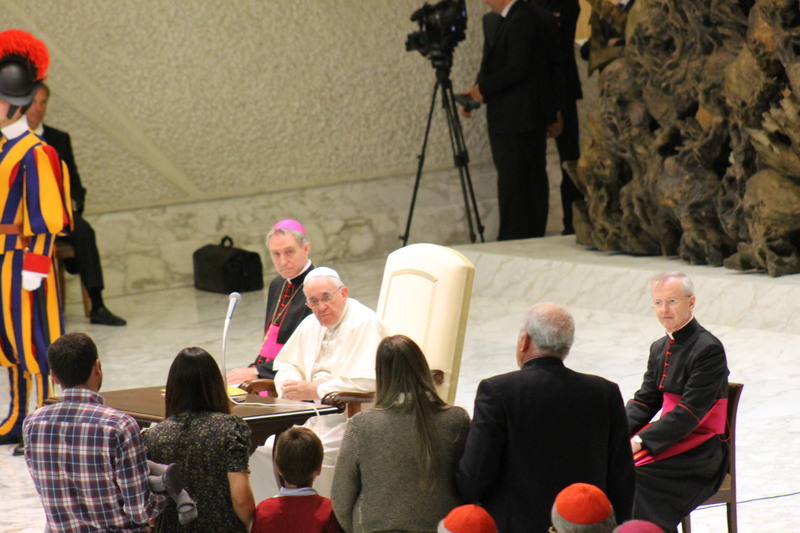 Even here – we’re in public and that is why I dare to say it – the Curia must be renewed. 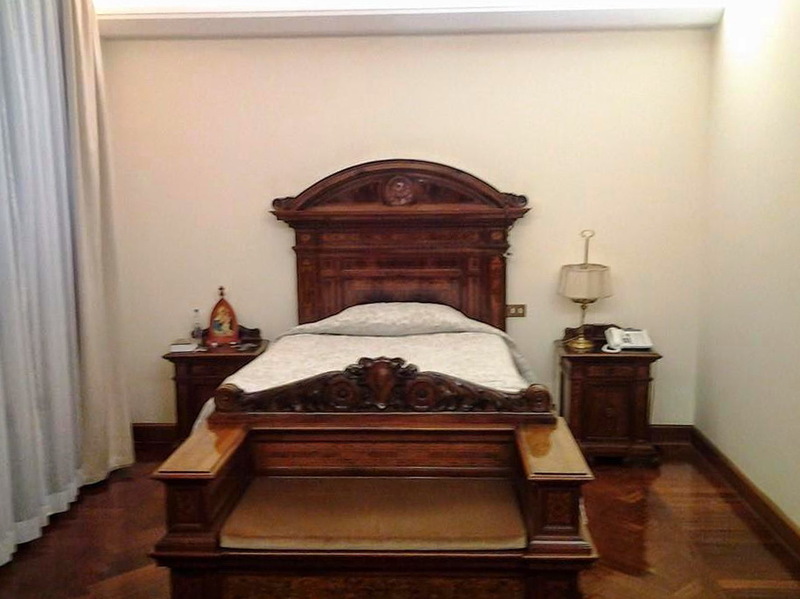 The Curia is renewing itself, the Vatican Bank must be renewed. All of these renewals are external. The things that the newspapers are reporting. It is interesting. None of them are talking about the renewal of the heart. They don’t understand anything about what it means to renew the Church. It is sanctity. Renew the heart of each person. Something else that helps me, which was your question, freedom of spirit. The more you pray and allow the Holy Spirit to act, the more he attains this holy freedom of spirit, which leads him to do things that bear tremendous fruit. Freedom of spirit. This is not the same as relaxation, no, no, it’s not the same. It isn’t idle, it’s not the same thing. No, no. Freedom of spirit requires faithfulness, and requires prayer. When we don’t pray, we don’t have this freedom. In other words, those who pray have freedom of spirit. They can do “crazy things” in the good sense of the word. “How did you get idea? How well it worked!” “And I, who know it, prayed and it came to me.” Freedom of spirit. Do not become encapsulated only — I say encapsulated, we need to understand this well — in directives, or things that imprison us. Let us return again to the image of the Doctors of the Law. They were so meticulous, so meticulous, about obeying the Ten Commandments that they invented another 600. No, this does not help. No, this leads you to be closed in, encapsulated. When the apostle plans – and here I’m touching on something that perhaps some of you won’t like, but I will say it – when the apostle believes that good planning makes things move forward, he is mistaken. This is functionalism. This is what businessmen need to do. We have to use these things, yes. But they are not the priority unless they are at the service of the other, freedom of spirit, prayer, vocation, apostolic zeal, going out. Watch out for functionalism! Sometimes I see at some Bishops’ Conferences or in dioceses where they have people who are responsible for everything, everything, nothing passes them by, and everything is very functional, very organized. But sometimes there are things missing or they do half of what they could have done with less functionalism and more apostolic zeal, more interior freedom, more prayer, in other words, this interior freedom, this courage to go out. This. I explained all this about functionalism, so that there is no doubt, in Evangelii Gaudium. You can read what I wanted to say there. Therefore, when Paul, in his first Epistle to the Corinthians, speaks about charism, these things which are so beautiful, about the body, about the Church, each one with its charism, how does he end? Let me explain it better. It ends by talking about love. In other words, the good things that come good from God, that belong to God and He teaches us to imitate him. Therefore, do not forget this. This is a frequent question: Am I de-centred, in this sense, or am I at the centre, as a person, or as a movement, as a charism? That which in Castilian Spanish — sorry if I speak in my porteña language [of those who are native to Buenos Aires] — in my Castilian porteño, we say “figuretti,” that is, the centre, the centre, is only Jesus. The apostle is always de-centred, because he is a servant, at the service of the centre. The de-centred charism does not say “us.” “Us” or “I.” It says Jesus. And me. Jesus and me. Jesus asks me, I have to do this for Jesus. He is always at the centre. We are orbiting around the person of Jesus. Do not forget. A movement, a charism, needs to be de-centred. Then, something that we are asked nowadays and reference was made to this when we were speaking about wards. Nowadays, we are suffering from increasingly greater “mis-encounters.” And with the key of mis-encounter we can re-address all the questions you asked. 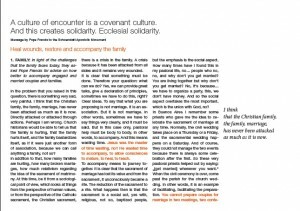 Family mis-encounters, testimonial mis-encounters, mis-encounters in announcing the Word, and the message, mis-encounters of wars, mis-encounters of families, in other words, mis-encounters, division, this is the devil’s weapon. As an aside, let me tell you that the devil exists, in case you have any doubts. He exists and he will get you. He exists and he will get you. And the path of mis-encounter results in fighting, in enmity, Babel. Just as the Church is this temple of living stones, built by the Holy Spirit, so too the devil builds another temple of arrogance, of pride, that results in mis-encounters, because no one can make themselves understood, each one says something different, this is Babel. And from there, we need to work for a culture of encounter. A culture that helps us to find ourselves as a family, as a movement, as a Church, as a parish. Always looking who we can find on another. I recommend – it would be great if you could do this during these days, I don’t know if it will slip your minds and you’ll forget: Take the story of Joseph and his brothers in the Book of Genesis. How this painful story of betrayal, jealousy, and mis-encounter ends in a story of encounter that results in a nation that for 400 years grows and becomes stronger. This people chosen by God. A culture of encounter. Read the story of Joseph, which runs for several chapters in Genesis. It will do you well so that you can see what I want to say with this. A culture of encounter is a covenant culture. In other words, God chose us, promised us, and in the midst of all, that made a covenant with his people. To Abraham, He said: “walk and I will tell you what I will give you.” Bit by bit, God told him that he would have more descendants than there are stars in the sky. The promise. He chooses him with a promise. At one point he says: “now covenant.” And the various covenants that he made with his people are those that build this path of promise and through encounter. 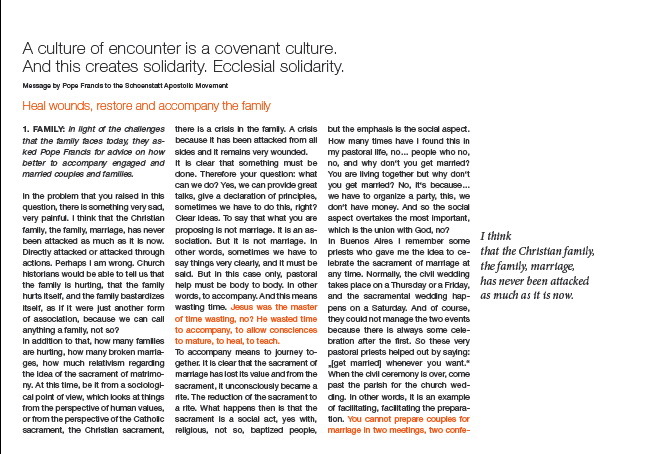 A culture of encounter is a covenant culture. And this creates solidarity. Ecclesial solidarity. You know that this is one of the words that are at risk. Just as every year or every three years, the Royal Spanish Academy meets to examine all the new words that are created – because we are a living language — in the same way, some disappear because they are dead languages, that is, they die and are no longer used. The word that is on the verge of dying, or because they want to kill it, eliminate it from the dictionary, is the word “solidarity.” And covenant means solidarity. It signifies the creation of bonds, not the destruction of bonds. And today we are living in this culture, in this culture of temporariness, which is a culture that destroys bonds. This is what we were speaking about, problems in the family, for example. Bonds are destroyed, instead of creating bonds. Why? Because we are living in a culture of temporariness, of mis-encounter, of the inability to enter into covenant. Therefore, a culture of encounter, this creates a unity that is not deceitful and is the unity of sanctity, which gives rise to the culture of encounter. Perhaps I want to end with this…it was very common for the chosen people, in the Bible, to renew the covenant, to make a renewal of the covenant, they renewed the covenant during specific feasts, in specific years, or after having won a battle, after having been freed and, with the coming of Jesus, he asks us to renew the covenant, not so? And He himself participates in this renewal in the Eucharist. In other words, when we celebrate the Eucharist, we celebrate the renewal of the covenant. Not only mimesis, but in a very deep, very real, very profound way. It is the same presence of God who renews the covenant with us. But let us not ignore, because we forget about it or because it’s not in fashion, the renewal of the covenant in the sacrament of Reconciliation. Don’t ever forget this, don’t ever forget it. When I don’t confess because I have no idea what to say to the priest, then something is wrong. Because we don’t have an interior light to discover the actions of the evil spirit that harms us. This renewal of the covenant in the Eucharist and in the sacrament of Penance, Reconciliation leads us towards sanctity always with this culture of encounter, with this solidarity, with this creation of bonds. And that is what I wish you. That in this world of mis-encounters, defamation, calumny, destruction with the tongue, you can take this culture of encounter onwards by renewing the covenant. Of course, nobody can be educated alone. You need Mother to educate you. Therefore, I entrust all of you to the Blessed Mother that she can continue to walk with you in this renewal of the covenant. Thank you. In giving you the blessing, I send you as missionaries in the years to come. I send you, not in my name, but in the name of Jesus. I send you, not alone, but hand-in-hand with our Mother Mary, and within the womb of our Mother, the Holy Church. I send out you in the name of the Father, and of the Son, and of the Holy Spirit. Before ending, I thank you for your visit with all my heart. And I have just remembered, when you asked what is my secret? I want to tell you two secrets. One, the General Superior said that he didn’t want to take my time because he didn’t want to delay my lunch. One secret is this: I never saw any priest that died of hunger. Second secret: Some time ago, a Schoenstatt Father gave me a picture of the Blessed Mother. And I have it on my bedside table. And every morning, when I get up, I touch her and pray to her. That is the secret I wanted to tell you. Thank you again for your visit. Don’t forget to pray for me who needs it. May God bless you and the Blessed Mother protect you. Thank you. 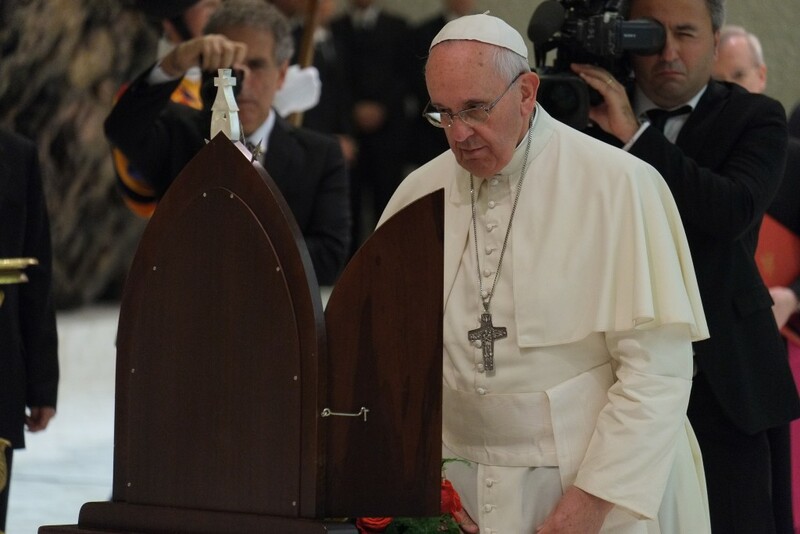 Text by the Holy Father: Transcription by María Fernanda Bernasconi, Radio Vatican. Correction: Monina Crivelli and Cecilia Mata, Buenos Aires, Argentina.